Now available in low luster black, this lensatic compass from CAMMENGA has been used by US troops, foreign militaries, law enforcement, special forces, and outdoor enthusiasts of every variety for decades. CAMMENGA has been the government’s exclusive manufacturer since September, 1992. This is NOT a replica. This is NOT a used compass. This compass is the REAL THING! and brand new from the manufacturer. The tritium light sources provide readability in total darkness, with a life-span of 10 years. This compass features both a 0-6400 mils scale (20 mil resolution) and a 0-360 degree scale (5 degree resolution), with an accuracy of +/- 40 mils. 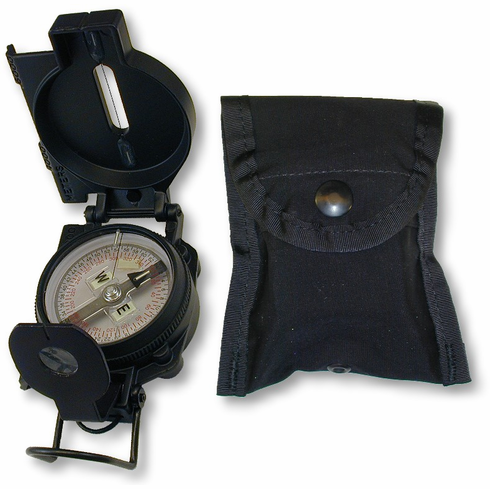 Other features of this most rugged and accurate compass are a sapphire jewel bearing, rotating bezel, a magnifying sighting optic, cast aluminum frame, black LC-1 pouch with belt clip, induction dampening, and a climate capacity ranging from -50 to +150 degrees F.